Make and bake cake mix as directed on box for 24 cupcakes. Cool in pans 10 minutes; remove from pans to cooling rack. Cool completely, about 30 minutes. In small bowl, reserve 1 cup frosting. Frost cupcakes with remaining white frosting. 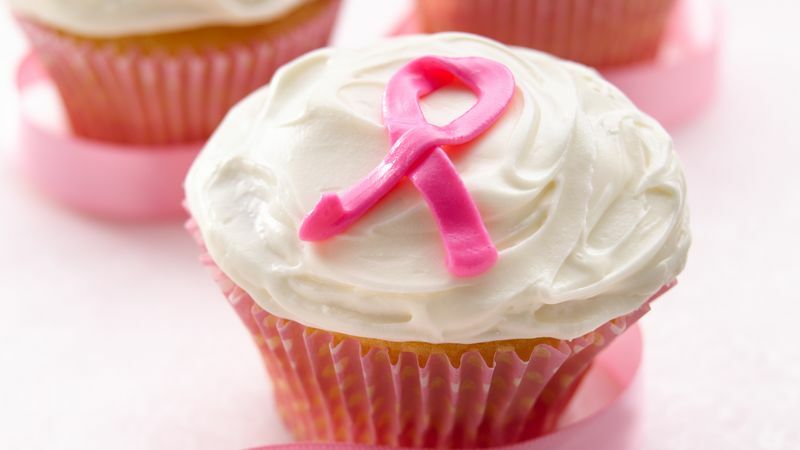 Stir pink food color into reserved 1 cup white frosting until desired pink color. Spoon frosting into freezer plastic bag; cut 1/4-inch hole in 1 bottom corner. Or use decorating bag with flat tip with 1/4-inch wide opening (#44). Gently squeeze bag to pipe frosting ribbon on cupcakes. Store loosely covered.